With an advent of minimally invasive surgery, the use of laparoscopy for ventral hernia repairs has become standard. Laparoscopic ventral hernia repair is associated with decreased perioperative pain, reduced hospital stay, and faster recovery. The mesh is placed as an intra-peritoneal underlay with wide coverage of the hernia defect. Minimal wound morbidity appears to be its biggest advantage over most open repairs. Numerous studies demonstrate that laparoscopic ventral hernia repair is an effective and safe approach to the abdominal wall hernia. Appropriate patient selection, safe abdominal access, adhesiolysis, precise mesh positioning, and fixation are key factors that ensure a safe and effective laparoscopic repair of most ventral defects. 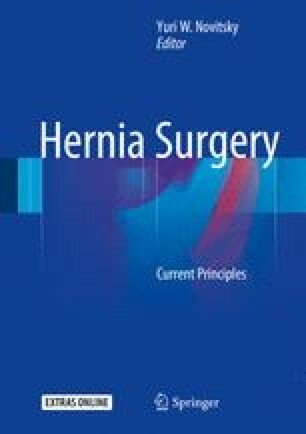 In this chapter, we will describe our perioperative patient selection and management, detail our operative techniques, and address potential pitfalls, contraindications, and complications of the traditional laparoscopic ventral hernia repair.